In our short time there, we could only see a tiny part of it. We flew from Melbourne to Sydney, borrowed a car, and headed north. 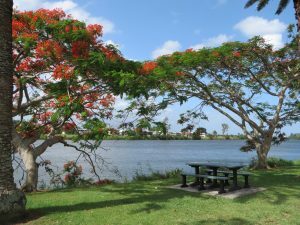 Port Macquarie service centre is a favourite stop of ours, because it is actually on the highway, whereas most other places require you to take an exit and drive a couple of kilometres to reach the town. 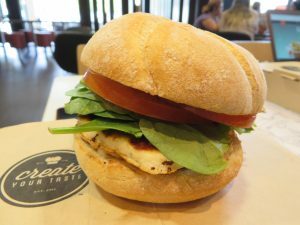 The town of Port Macquarie is 9km from the highway, but the service centre on the highway has a McDonalds, KFC, and a couple of other food outlets beside the service station. 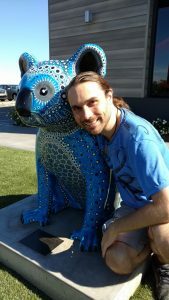 This time, we discovered that McDonalds had upgraded its playground to a huge multi-storey complex, in installed a koala statue painted in Aboriginalesque dot motif. Our first overnight stop was with a friend in Coffs Harbour. He took us to meet Buddy, a greyhound, and Buddy’s humans. 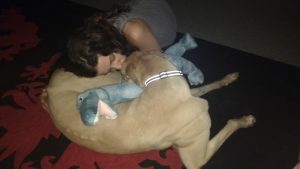 Buddy had just received a stuffed dinosaur, and fallen in love. We were not sure how long the dinosaur would last, as some of the games seemed a bit rough. But Buddy was definitely happy. Greyhounds are bigger than we realised! From Coffs Harbour, we moved on to Ballina, and Jenny’s other sister-in-law. On the way, we stopped at a roadside park in Woodburn, an unremarkable Australian town on an unremarkable Australian river. Even the unremarkable parts of Australia are quite pretty! 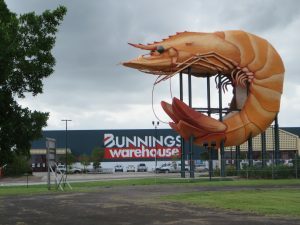 Ballina is the home of The Big Prawn. Australia has a tradition of Big Things, representing the products (usually agricultural) of the area. Coffs Harbour has The Big Banana, and Ballina has The Big Prawn. Also The Big Bunnings! Pete and Jude live a few hundred metres from the beach in Ballina, so Ravi was able to get in his first swim in Australia. We met Harper’s mice, had a solid night’s sleep, and headed north again. This time it was a quick trip to the Gold Coast to have lunch and a catch up with Jenny’s cousin, Scott. After lunch, we carried on up to Brisbane, and stayed a few nights with Jenny’s brother and his family. 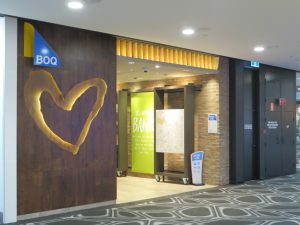 They live quite close to Toowong Shopping Centre, where we saw this bank branch. It really seemed to be doing everything it could to look like anything but a bank! And the love heart? Really? We had some great conversations with the family in Brisbane, and found a cafe with WiFi in the shopping centre where we could work in air conditioning. Too soon, it was time to move on. This was our longest single day of travel – ten hours of driving from Brisbane to Hargraves, near Mudgee in New South Wales. 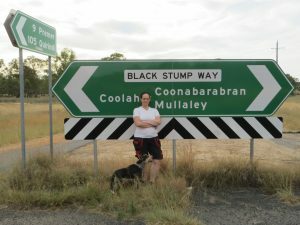 There is an Australian saying “beyond the Black Stump”, which means a long way out in the remote countryside. We were certainly out Black Stump way on this trip! We got on the road in good time, only to realise that we had lost an hour when we crossed the border back into New South Wales! Queensland has a quaint custom of ignoring the moment when the other East Coast states put their clocks forward for daylight savings. For six months of the year, it is in a different time zone. The next day, we had a chance to have a proper look around. Our friends, Carmel and Justin, moved three months ago – a tree change from Sydney to a 100-acre property. 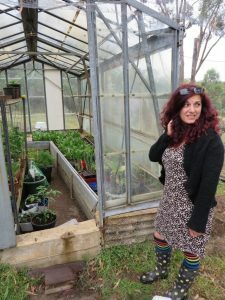 The place is a find – solar panels, two-bedroom house, greenhouse, two machinery sheds, a pool, and a bunch of farm equipment, ready to go. 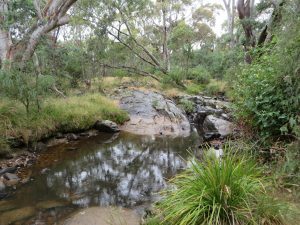 There are a number of endangered eucalypt species on the property, and they are keen to conserve them. Their back boundary is a creek, which was peaceful and inviting (apart from the areas where both banks were covered in blackberry bushes). The previous owner seems to have spent all his time watching television and playing model trains, so they have 20 years of neglect to repair. 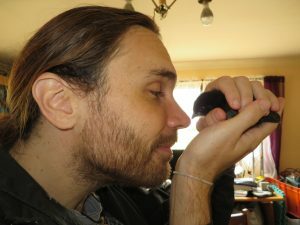 When we arrived, they had chickens that were ten days old, too small to be in a run outside. They had an enclosure in the dining room. They collected 12 chickens from Kellyville, on the outskirts of Sydney, but by the time we arrived, a few days later, there were only six still alive. Chickens are quite fragile, apparently. There will be a challenge keeping the chooks outside, because there is a pack of wild dogs roaming the area. They are BIG, and routinely take sheep and goats. Strong fences and a solid nesting-house will be required! From Hargraves, we headed back to Sydney for the first of many family gatherings. 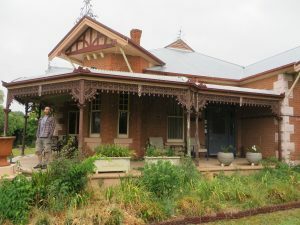 We stopped in Mudgee to visit the house where Ravi’s father spent his younger years. It is now heritage listed, and operates as a B&B. Mudgee has a lot of very well-maintained historic buildings, and was the cleanest, prettiest town we passed through in the entire trip. Back in Sydney, we spent a few nights with Jenny’s parents, and attended a Christmas gathering of Ravi’s father’s side of the family. 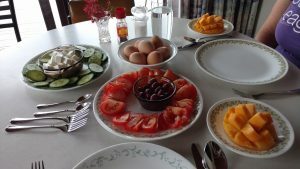 Jenny’s mother outdid herself with a spectacular Turkish-style breakfast. We had a casual conversation about their trip to Turkey and our stay with a Turkish Couchsurfing host in Bucharest, Romania. The next morning, we awoke to this! We were joined at breakfast by a couple of kookaburras. 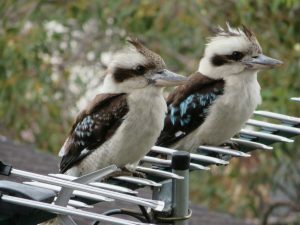 They sat placidly on the next door neighbour’s antenna and posed for the camera. We returned the borrowed car at the family Christmas do, so our next leg of travel was a train trip to Moss Vale. Our friend Marci lives there with her husband and son. Her mother (from Canada) was also staying with them for an extended visit of several months. 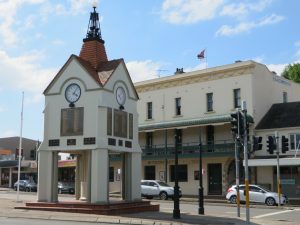 Moss Vale is another lovely Australian town with well-preserved historic buildings, just a couple of hours south of Sydney. We actually hopped off the train at Mittagong, because Marci was there, having her hair done, at the time our train pulled in. We had a great time catching up with Marci and Geoff that night. It is summer school holidays in Australia, so the next day was occupied with entertaining Matty. He had a friend over, and we all headed out to Carrington Falls, near Robertson. 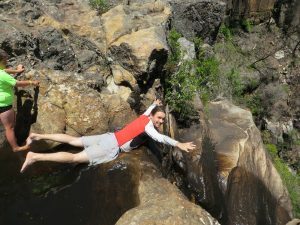 Carrington Falls represents a typical landform in Australia – the eroded plateau. The river runs along the harder stone cap rock, until it reaches the edge. There, it progressively wears away the edge, creating a narrow, deep valley and a waterfall. Small stones on the flat rock river bed erode deep holes, and one of these holes is right by the lip of the falls. This means you can get right to the very edge in (relative) safety. After a long, hard day of recreation, Matty broke out “The Thumper”, and we enjoyed a vibrational massage. The next day, Marci was driving up to Sydney, so we rode up together. Our first stop was Costco Casula, where the car was to get new tyres fitted. Yes, they sell tyres at Costco. And fit them. 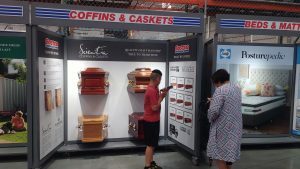 And that’s not all – we saw spa baths, super-sized Christmas decorations, and even coffins for sale! Once the car had its new shoes on, Marci took us all the way to our next destination – Ashfield. We would be cat-sitting for two weeks while friends of ours took a trip to Japan.